Eleazar Juarez, owner of Rio de Parras Organics, pressed a brown bag full of greens into my hands. I peered inside and beyond the feathered leaves I saw the pale, straggly cilantro roots still attached. Who knew that a simple herb could invoke such a spring in my step! Ever since I discovered the recipe for Chinese barbecued pork (char siu) in the Chong Family cookbook, I’d been at a lost where to find cilantro roots. I didn’t want to pull out the fragile seedlings growing on my windowsill and everywhere I went cilantro was sold with the roots already lopped off. Then it hit me. Duh, ask a farmer! And so I did. If your hunt is not as successful, the stems will do fine. Besides, not all recipes for char siu call for cilantro roots. I must say that the addition does add an earthy and musky nuance which I thoroughly enjoy. Cilantro roots are also used in Thai cooking. Fat roots are crushed to flavor soups just like lemongrass and thinner ones thrown into stir-fries. 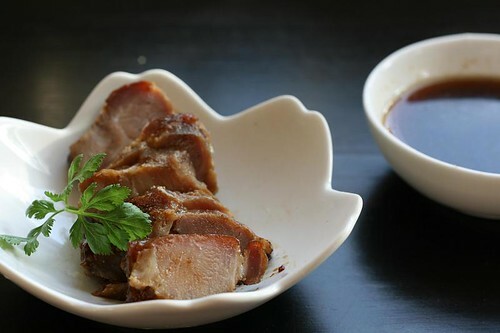 The words char siu literally mean “fork burnt or roasted,” a nod to the traditional preparation method of skewering strips of pork with long forks or hooks and cooking them over a fire or in a hot oven. This has its benefits. It allows the meat to cook evenly from all sides. If you’d like to try this, hang pork strips from metal S-hooks on a high rack in your oven over a foil-lined pan on the lowest rack to catch the drippings. I improvised even further by rolling strips of aluminum foil to act as loops and tied them to the upper rack (see photo below). Cut the pork lengthwise into four long strips. Lay each strip flat on the cutting board and cut in half lengthwise. You will end up with 8 strips about 1½ inches wide, 1 ½ inches deep and 7 to 8 inches long. Place in a dish large enough to hold all the pieces in one layer. In a small bowl, mix the together the sugar, soy sauce, green onions, cilantro, star anise, rice wine, sesame oil, and 5-spice powder. Pour the marinade over the pork. Cover with plastic wrap and marinate in the refrigerator for at least 2 hours, or preferably a day and a half. Remove the pork from the marinade and place on a broiling rack set on top of a foil-lined roasting pan to catch the drippings. Reserve the marinade. Bake for 40 to 45 minutes, flipping halfway, or until the pork starts caramelizing and is just beginning to char at the edges. Baste at least once on each side during the first 30 minutes of cooking. Transfer the pork to a chopping board and let rest for about 10 minutes before cutting crosswise into ¼-inch-thick slices. Meanwhile, simmer the reserved marinade over medium heat for at least 10 minutes and skim off any scum that rises to the surface. Serve with freshly steamed rice or noodles and sauce. I was just introduced to Char Siu on Monday, so I came to your site, hoping – I was thrilled to find it here. Thanks, Pat, I can’t wait to try it. Oh oh oh … I hope you love it! It’s so easy and tasty and goes with just about everything. I have some marinated belly pork meant for roasting char siew in my freezer. Will try to roast them vertically like the innovative way you share here! That is brilliant!! JC, tell me how it goes! I find it perplexing that Thai restaurants are ubiquitous but cilantro roots are no where to be seen even in the Asian (read: Chinese, Viet, and Korean) groceries in the Pacific Northwest. 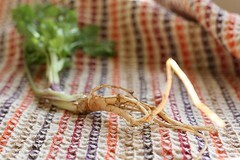 If the grocers can sell Chinese celery with some roots still intact, I wonder why they won’t sell cilantro with roots…. Hi Tuty! Yeah, it’s weird but seriously, ask a farmer and he’ll be more than wiling to oblige. I love Char Sui Ro. Brings back memories walking around Boston’s China town with all that meat hanging in the windows. The recipes I’ve used never specified cilantro root, but I bet it’s great. 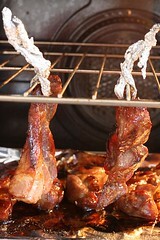 I like the skewering / hanging in the oven trick – I will have to try it – maybe even this weekend! Hi Shirley, I’m with you–BBQ pork, duck and chicken hanging in the windows … yum! I hope the hanging trick works for you. I found the meat a lot juicier and evenly cooked.